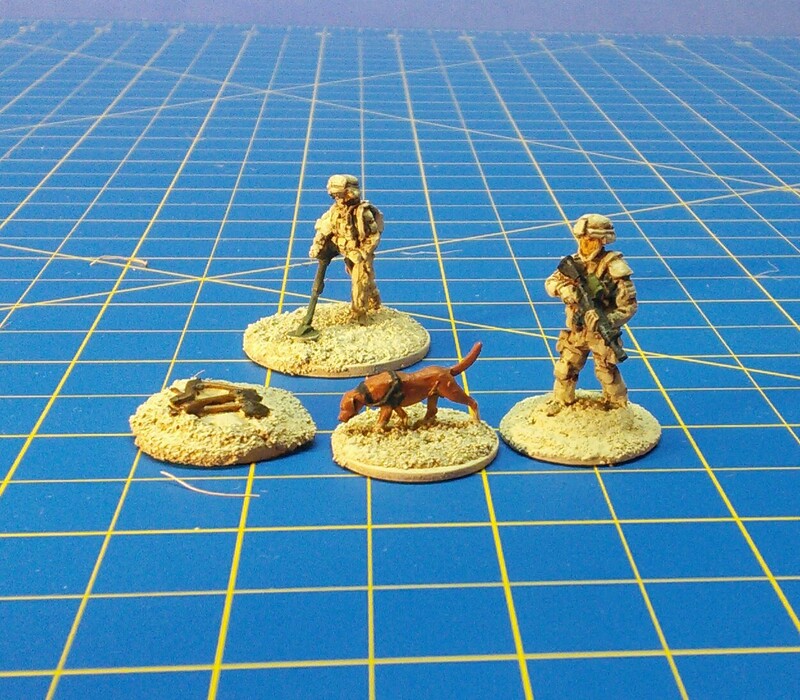 A medley of finished pieces for the Afghanistan project. First up, some JTF2 operators. Naturally these guys don't stand around for photo ops, but a video from the Canadian Armed Forces https://youtu.be/A5_IbxfB1ZA shows them looking a lot like US Navy SEALs in the DEVGRU kit and very dusty and subdued looking, so I tried for the same look. One of each of Elheim Figures three packs plus the special edition figure gives me 13 operators to add to the sniper team. They can keep busy trying to rescue this guy, a downed pilot. 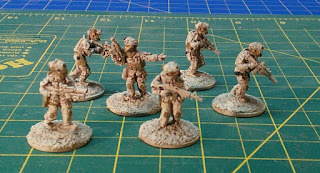 Next is the Wartime Figures (which Elheim also sells) EOD set. A sapper (sappers are nicknamed "Chimos" in the Canadian Army, it's an Innu word apparently) with mine detector and a sniffer dog. 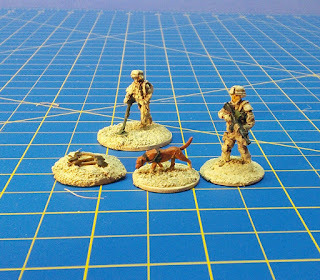 The dog handler is a previously painted Canadian rifleman. The suspicious digging\ IED marker is from Mikey. 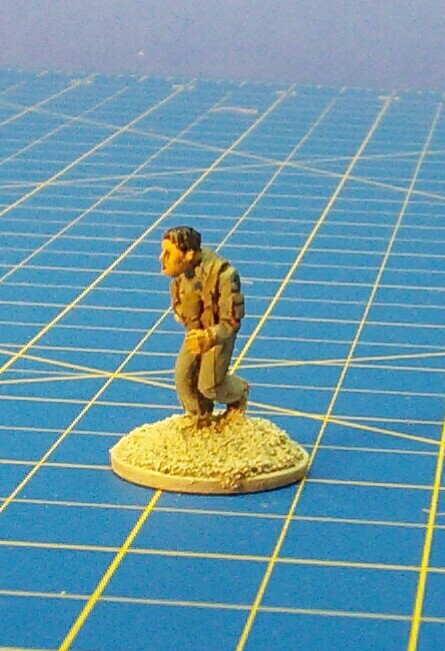 He got a few mine field markers from his Battlefront North Africa stuff and gave me one. 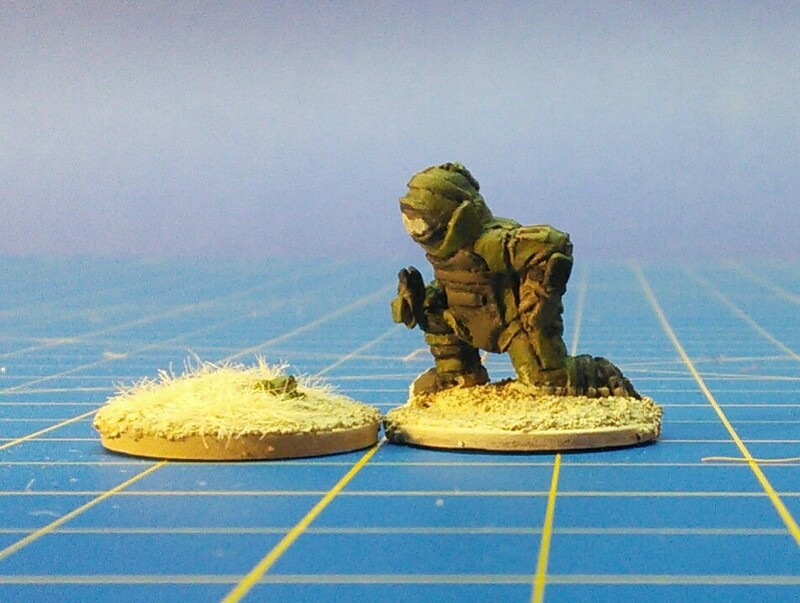 The Wartime set also includes an EOD tech, seen here defusing one of my homemade IED markers. Next up are reinforcements for the Taliban (nicknamed Timmy by Canadian troops). The Wartime insurgents with support weapons pack gave me two LMGs, two RPGs, another sniper and a fellow with a grenade launcher on his AK. The Wartime insurgents with AKs gave me some more figure variation. Then three packs of Elheim Figures TAL03n, local Taliban with AKs, another pack of RPGs and the pack TAL33 Taliban with PKM LMG to boost my fighters. These additions give my Taliban 6 more fireteams, or a 120% increase in troop strength. 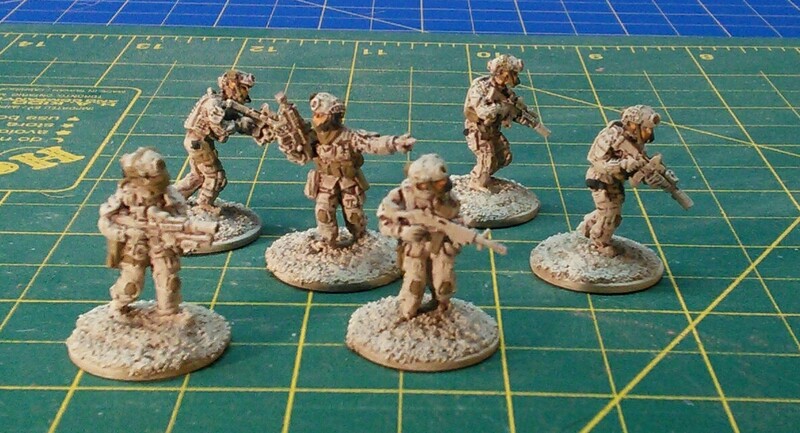 Naturally the new Black Ops from Osprey have piqued my interest for the special forces actions. I was hoping to have the grape mounds done a month ago, but alas, life got in the way! 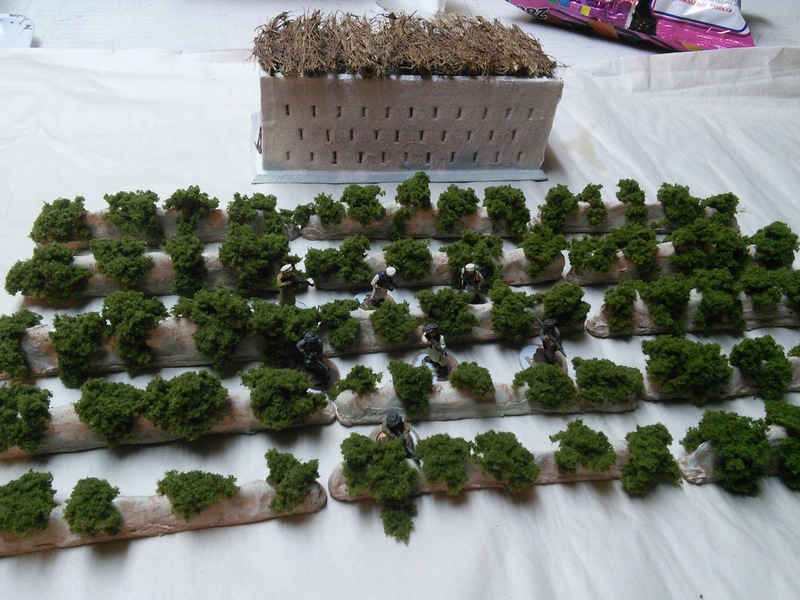 It took much longer to get the Woodland Scenics Clump Foliage than expected, which involved a road trip to London with Mikey. I decided against super glue as too expensive. Regular white glue however proved too runny, sliding off the sides of the grape mounds. Plus I buy it in a big jug, decant and brush on, adding to the complexity. However, Mrs. Rabbitman came to my rescue, telling me of a craft glue called Aleene's Tacky Glue. It is what it says on the bottle. White glue but thicker and stickier. Fortunately there is a craft store not too far away. So I bought glue and Mrs. Rabbitman bought yarn. After much delay I could finally settle down to several hours of Netflix and get stuck in! It probably took me about 6 to 8 hours of gluing over about three days. Here's some of them in front of a grape hut with the new Taliban for effect. As you can see there's quite a few, and I still have half the bag of clump foliage left. These should make the battlefield more complex. 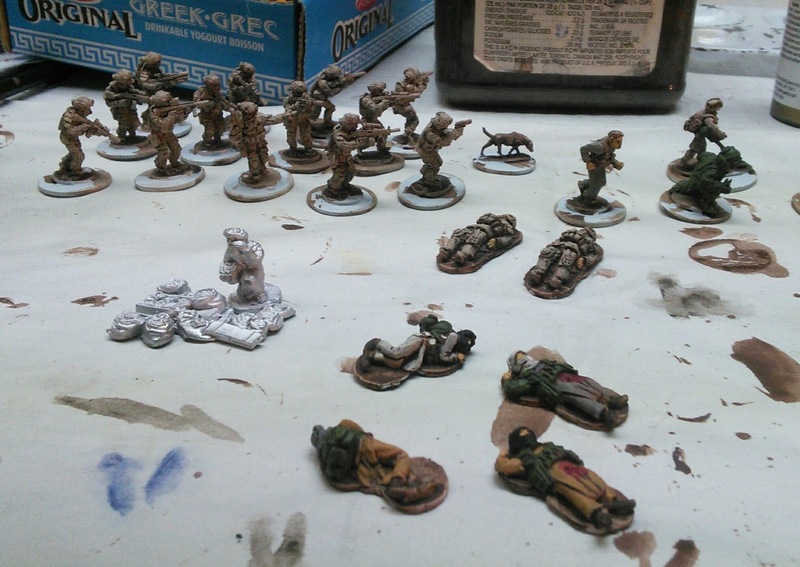 It's taken a while, but with Remembrance Day over, cadets are slowing down now and I can get some more hobby time. 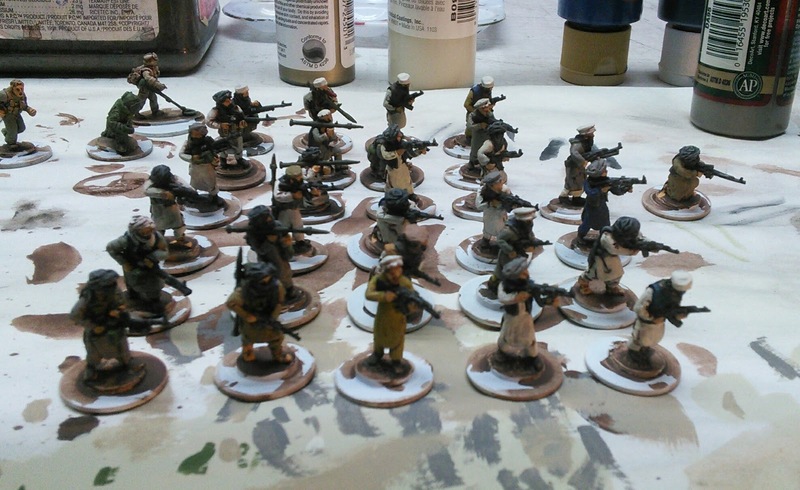 The Taliban reinforcements I got at the beginning of October are nearing completion. 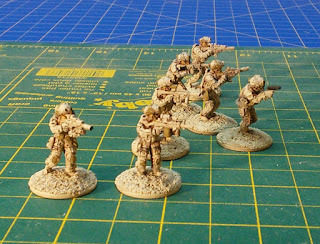 6 fire teams each with an RPG, a LMG and two or three riflemen. This will be a 120% increase in insurgent strength. 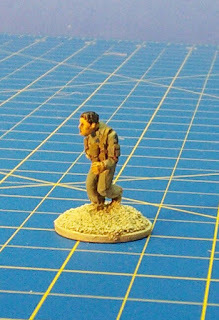 Plus another sniper, who was part of the Wartime support pack. 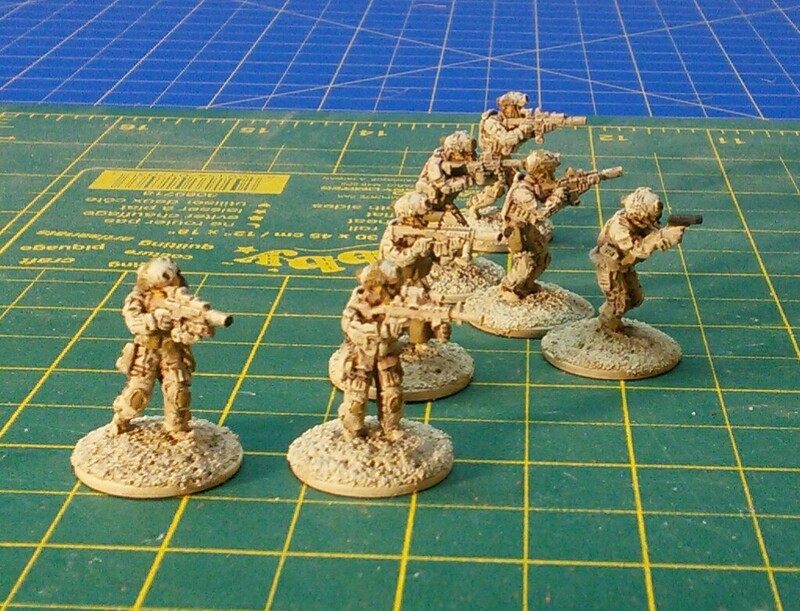 The additions to the ISAF forces also got some paint too. I think I'm going to like the special ops teams. But as you can see, I'm still mulling over how to base up the Afghan merchant and his wares. Some of the gang went to Fall-In last weekend. 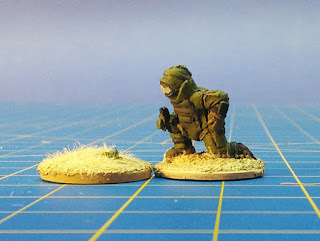 Mikey saw these resin terrain pieces and thought I'd like them. Very nice. Allied troops did encounter some industrial areas in Normandy. 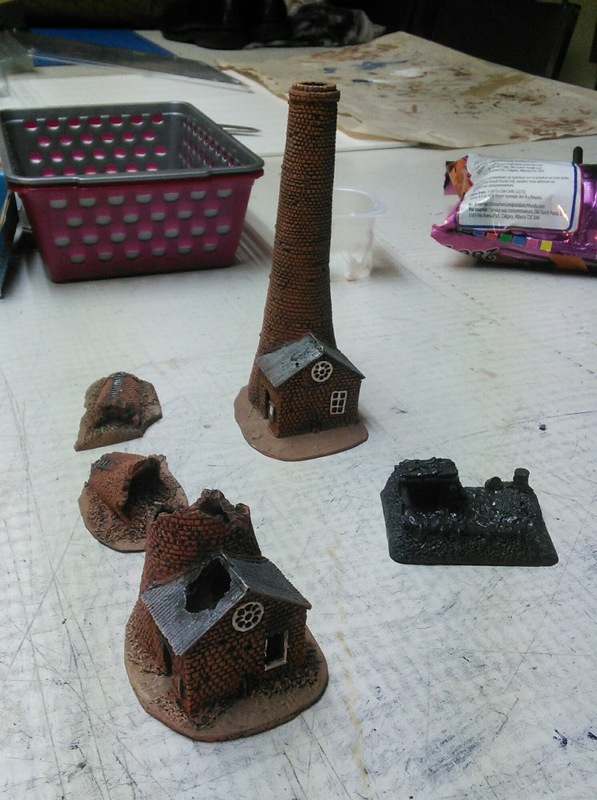 Although some brick warehouses or work shops would be a good addition. Hopefully there will be more gaming through the winter to report on! I sold my 15mm ancient armies last spring. Walter said he'd give me "serious money" and I wanted to finance other projects (Afghanistan). He really just wanted my Goths, but he took the late Romans and Sassanids too. Then came back for my Republican Romans and Spanish. I hadn't been happy with my ancient games anyway. They weren't very satisfying. Maybe because I had to do too much of the heavy lifting. Or maybe I have not been able to resolve a good game with my interpretation of history. Big Battles don't give much variety in scenario. They tended to be pretty straightforward and once deployed did the commanders have much influence? Last week's Ronin game was on the other extreme and again unsatisfactory. It is I feel, too gritty. Perhaps excellent for two or three characters fighting in a tea house, but not any bigger. And I do want bigger. So what do I want from an ancient game? I want the Big Men to have some effect. Rallying troops with a stirring speach or wading into a melee with their famous sword to turn the tide. But I still want units and manoeuvre and tactics. So too big and the characters get lost or just give a plus 1. Too small and its D&D.